Please congratulate the boys soccer team on another tough win Friday night (3-1) over Lockhart. With playoff seeding on the line, the boys came out and played great. Getting off to a quick start, Jousue Montalvan scored in the ninth minute of the first half, on an assist from Luis Lopez. 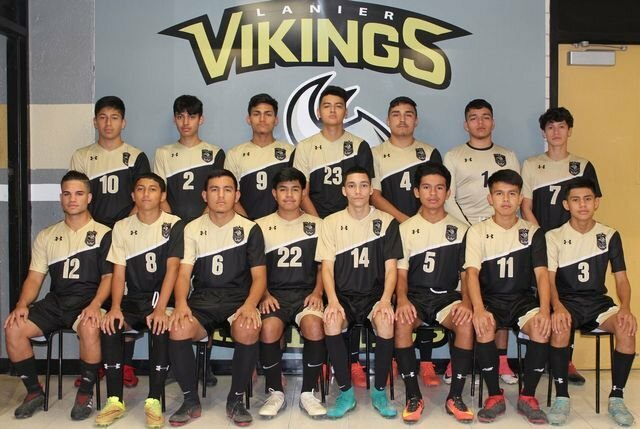 In the second half Juan Alvarez scored on a penalty kick, and Rodrigo Suarez added a goal on another assist from Luis Lopez. The win secures a no worse than second place district finish for the Vikings. Please come support the team for their LAST district home game, and Senior night, this Thursday 3/14 at Nelson Field. The Senior Night presentation will begin at the conclusion of the JVA game (approx 7:15) with Varsity kicking off at 7:45. JVAs 5 game unbeaten streak came to an end on Friday night, as they played well but came up short in a 0-1 loss. Miguel Romero, Ryan Arteaga, Victor Avila, and Hernan Aguilera all turned in strong defensive performances.